This was the 4th loaf I tried from Lahey's beautiful bread bible, and they just keep getting better and better (or maybe I am just a more confident bread baker now). This loaf uses more yeast than the last 3 that I made. This one uses 3/4 tsp of active yeast, vs. the scant 1/4 tsp that the others used. I also didn't have to let this sucker rise for 18 hours in the bowl. It was alive and kicking the next a.m. after only 12 hours of sitting in the bowl covered in plastic. 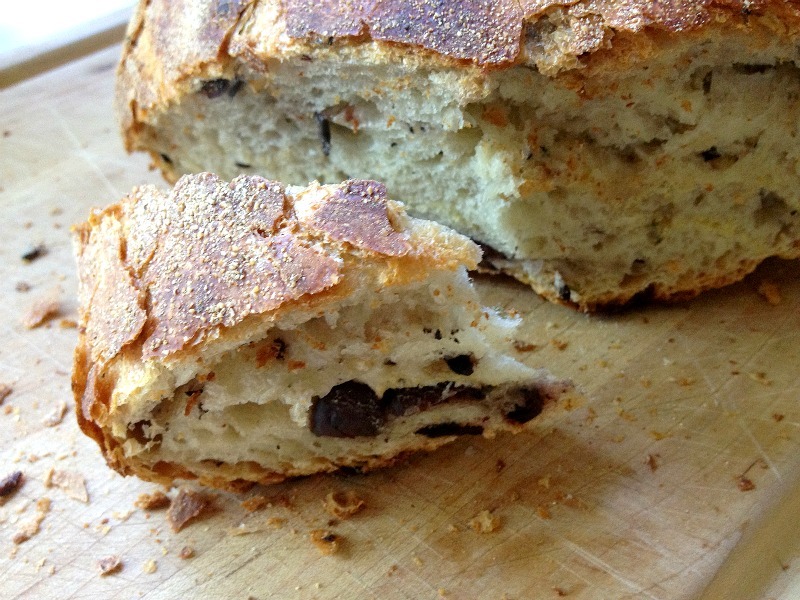 It was also wetter and stickier than the other loaves, probably from the moisture in the olives. 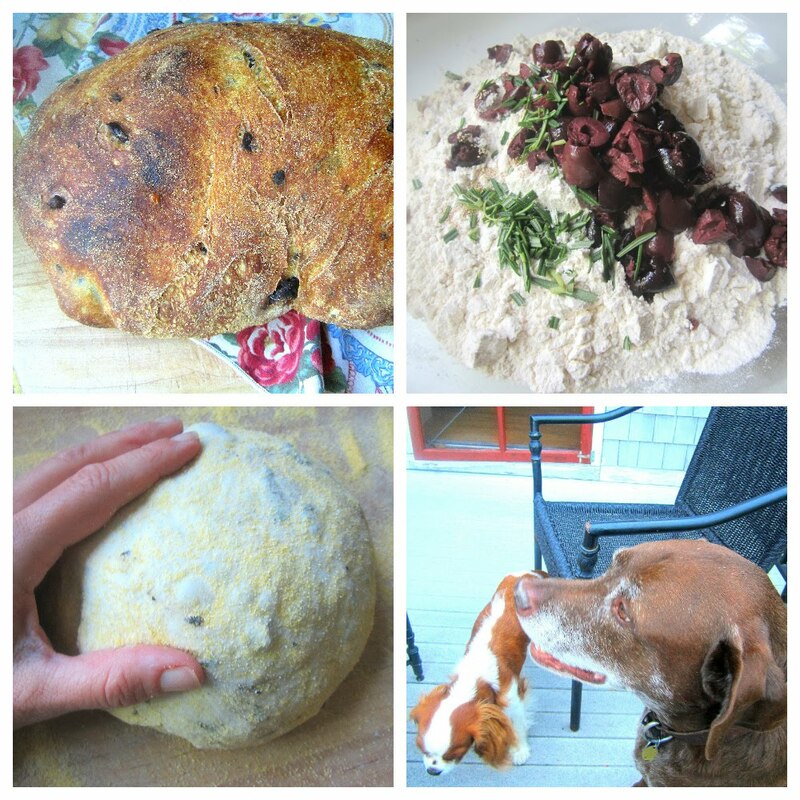 I used pitted kalamata olives, but you can use any good eating olive that you like. I also added fresh rosemary to the mix, but why not try thyme or another herb you like? I tried dusting the loaf with cornmeal this time instead of flour, and I liked the rustic feel even better. 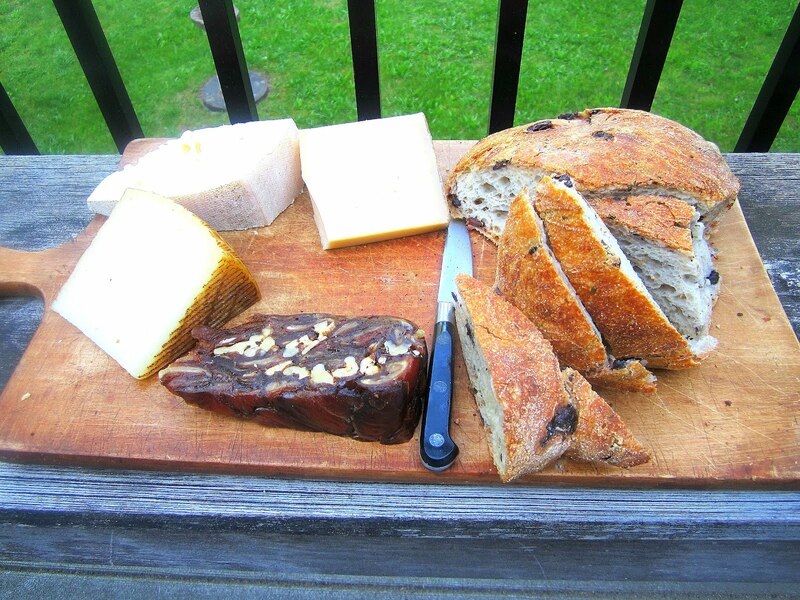 This was a wonderful addition to cheese night on my friend Rosemary's patio. Her dog Webster and visiting dog Henry (yes, I said Henry), tried some of the bread too. I love baking these easy no knead breads, and this was my favorite loaf so far. If you haven't tried it yet. Do it. You will thank me later. *(and thank you Ellen for telling me to store my opened yeast in a sealed container in the fridge, so I don't have to throw away the opened packets! It stays active a long time). Mix the flour, yeast, olives and herbs together in a large glass bowl (I have a vintage Pyrex). Add the cool water and mix together with your hands or a wooden spoon. Cover the bowl with plastic wrap and leave on the counter, in a cool dry place for 12-16 hours. The dough should double in size and spread in the bowl and have nice little bubbles all over it. I like to do this the night before, so when I wake up it's ready for the next step. Dust a cutting board or piece of marble with flour or cornmeal and turn out the dough onto the board. I find using a rubber spatula is the best way to release the sticky dough. Gently fold the dough over a few times with your hands to make a nice round ball, it should feel like a water balloon. Dust with enough flour or cornmeal so it is easy to move around. Wrap loosely in a clean tea towel (not linen, or it will stick) and let sit on the counter for another hour or so. Place a large 6-7 quart Dutch oven or casserole with lid (I use a big Le Creuset) in the oven for 15 minutes to preheat. Lay the water balloon (I mean the dough) on parchment paper big enough to fit inside the pot, this will prevent a messy sticky situation and guarantee a successful lift out. After the pot is preheated, slip the parchment paper with dough into the pot and bake COVERED for 30 minutes. UNCOVER the pot and bake another 15-20 minutes until you have a nice crisp golden crust. I like my bread best a few minutes after it comes out of the oven, and the next day toasted with butter. 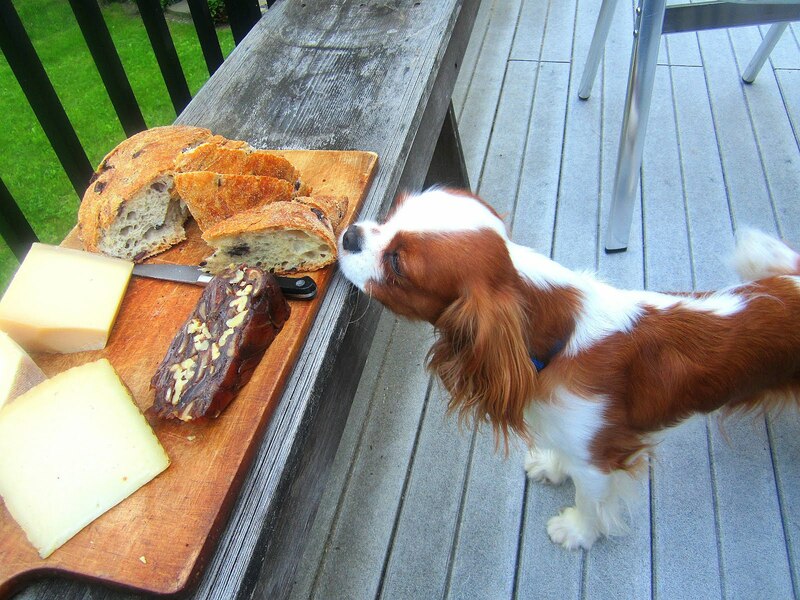 This would be a great loaf for tuna salad too. This looks wonderful...and easy! Always fun to see Webster and Rosemary's visiting dogs! I loved one of your past posts so much about his bread I bought the book....and having lotsa fun with it. Haven't tried this one yet. What's the dark slice on the cheese board? Stacey, Your bread was delicious and yes, we enjoyed it toasted with butter the next day. Thanks for coming over with Henry and your famous snacks. Is the garden loving this rain? Your bounty has been fabulous this year. Moan. I love that crispy crunchy crust! To make it one step better, just add a small handful of roasted (just before the mushy stage), garlic cloves. 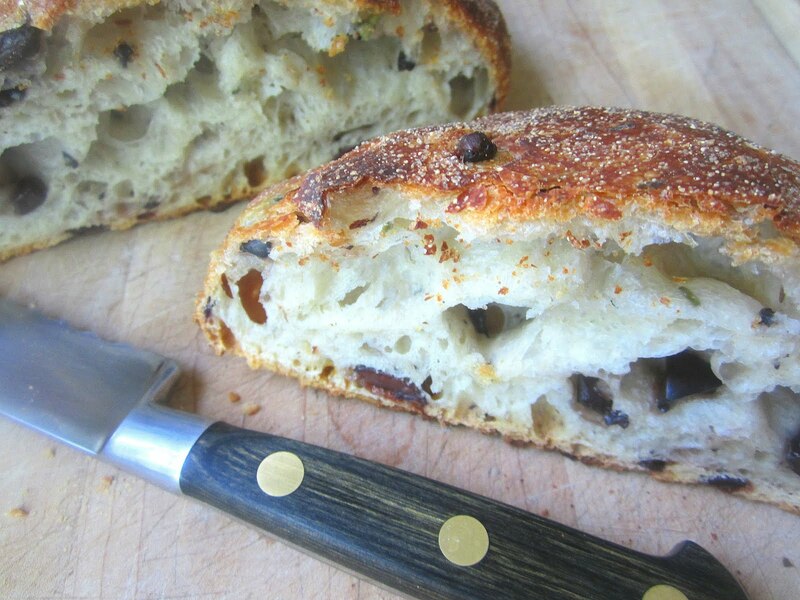 Jim Lahey's book and recipes are a treasure and I love that olive loaf. The dogs too, I see.